We all know that we should be eating more fruits and vegetables. Many of us find it quite easy to add an extra piece of fruit to our diet – after all, most fruits are tasty and quite sweet. But it is a little more difficult to get ourselves eating more vegetables outside of normal mealtimes and very difficult sometimes to persuade our children to eat anything green at all. However, the benefits of vegetables cannot be overemphasized as they protect us from a whole range of illnesses that plague our digestive health – everything from preventing constipation that can lead to haemorrhoids to offering a good degree of protection in the long-term from the risk of colon and bowel cancers. Green vegetables such as broccoli help to protect our bones from osteoporosis. A vegetable-rich diet helps to keep our immune systems strong so that we can fight off minor ailments such as coughs and colds and heal minor injuries. A diet rich in fresh vegetables also fills us up and keeps us feeling full so that we do not snack on high calorie foods that lead to weight gain. Making vegetables more palatable and more enjoyable for all the family is easy to do if you have a smoothie maker or blender. Green vegetables can be mixed with carrots, tomatoes and even fresh or frozen fruits for sweetness to make a delicious drink that it easy to swallow – quite literally! We owe it to our children to introduce them to healthier eating habits. Childhood obesity is becoming a major problem and there are so many reasons why this might be. In the 21st century, with all the pressures of modern life, children tend to lead less of an outdoor life than they did in our parents’ day. Much of our food is more processed and higher in calories than it was back then too. The video below is a lesson for all of us who are parents and grandparents to think of our children’s future health by taking care of their diet today. On this site, check out our ideas for healthy smoothies. We have tips and recipes. Smoothies can be a great way to introduce our children to healthier eating and getting them to enjoy making their own delicious fruit smoothies instead of reaching for the cookie jar or a fizzy drink when they come in from school is an easy way to get them to start making positive decisions about their health. 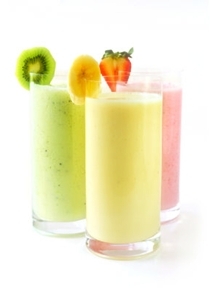 If you don’t have a smoothie maker, you may have a food processor with a liquidiser, or you may have a blender or even a stick blender so it is easy to get started without spending any money – you just won’t be able to blend smoothies with frozen fruits or ice cubes.